The Godavari is India's second longest river after the Ganga. Its source is in Triambakeshwar, Maharashtra. It flows east for 1,465 kilometres (910 mi) draining the states of Maharashtra (48.6%), Telangana (18.8%), Andhra Pradesh (4.5%), Chhattisgarh (10.9%), Madhya Pradesh (10.0%), Odisha (5.7%), and Karnataka (1.4%) emptying into Bay of Bengal through its extensive network of tributaries. Measuring up to 312,812 km2 (120,777 sq mi), it forms one of the largest river basins in the Indian subcontinent, with only the Ganges and Indus rivers having a larger drainage basin. In terms of length, catchment area and discharge, the Godavari river is the largest in peninsular India, and had been dubbed as the Vridha Ganga – Ganges. The river has been revered in Hindu scriptures for many millennia and continues to harbour and nourish a rich cultural heritage. In the past few decades, the river has been barricaded by a number of barrages and dams, restricting its flow. The river delta supports 729 persons/km2 – nearly twice the density average for the nation, and has been categorized as having substantial to greater risk of flooding with rising sea levels. 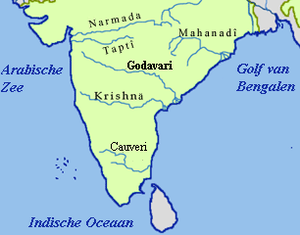 The Godavari originates in the Western Ghats of central India near Nashik in Maharashtra, 80 km (50 mi) from the Arabian Sea. It flows for 1,465 km (910 mi), first eastwards across the Deccan Plateau then turns southeast, entering the West Godavari district and East Godavari district of Andhra Pradesh, until it splits into two distributaries that widen into a large river delta and flow into the Bay of Bengal. In Maharashtra state where it takes origin, the river has an extensive course, the upper basin (origin to its confluence with Manjira) of which lies entirely within the state, cumulatively draining an area as large as 152,199 km2 (58,764 sq mi) – about half the area of Maharashtra. Within Nashik District the river assumes a north-easterly course till it flows into the Gangapur Reservoir created by a dam of the same name. The reservoir along with the Kashypi Dam provides potable water to Nashik, one of the largest cities located on its banks. The river as it emerges through the dam, some 8 km (5.0 mi) upstream from Nashik, flows on a rocky bed undulated by a series of chasms and rocky ledges, resulting in the formation of two significant waterfalls – the Gangapur waterfalls and the Someshwar Waterfalls, the latter, located at Someshwar and more popularly known as the Dudhsagar Waterfall About 10 km (6.2 mi) east of Gangapur the river passes the town of Nashik where it collects its effluents in the form of the river Nasardi on its right bank. Ahmednagar and Aurangabad: Along the boundary here, it receives its first major tributary Pravara River, draining the former district, the confluence located at Pravarasangam. By virtue of a sub-tributary of Pravara – Mandohol, which originates in Pune District – the basin impinges the Pune District. The river at Paithan has been impounded by the Jayakwadi Dam forming the NathSagar Reservoir. Kalsubai located in Godavari basin, is the highest peak in Maharashtra. The river beyond, near the village Sonpeth, flows into Parbhani. In Parbhani District, River Godavari flows through Gangakhed taluka. As mentioned above Godavari is also called Dakshinganga so the city is called as Gangakhed ( meaning a village on the bank of Ganga ) . As per Hindu rituals this place is considered quite important for after death peace to flow ashes into the river it . It then exits into the neighboring district of Nanded where 10 km (6.2 mi) before reaching the town Nanded, is impounded by the Vishnupuri Dam and thus with it, bringing Asia's largest lift irrigation projects to life. A little downstream from Nanded, the river receives Asna, a small stream, on its left bank.It then runs into the controversial Babli project soon ends its course within Maharashtra, albeit temporarily, at its merger with a major tributary – Manjira. The river after flowing into Telangana, re-emerges to run as a state boundary separating the Mancherial, Telangana from Gadchiroli, Maharashtra. At the state border, it runs between Sironcha and Somnoor Sangam receiving one tributary at each of those nodal points – the Pranhita and subsequently the Indravati. Godavari enters into Telangana in Nizamabad district at Kandakurthy where Manjira, Haridra rivers joins Godavari and forms Triveni Sangamam. The river flows along the border between Nirmal and Mancherial districts in the north and Nizamabad, Jagityal, Peddapalli districts to its south. About 12 km (7.5 mi) after entering Telangana it merges with the back waters of the Sriram Sagar Dam. The river after emerging through the dam gates, enjoys a wide river bed, often splitting to encase sandy islands. The river receives a minor but significant tributary Kadam river. It then emerges at its eastern side to act as state border with Maharashtra only to later enter into Bhadradri Kothagudem district. In this district the river flows through an important Hindu pilgrimage town – Bhadrachalam. The river at Papi Hills in Andhra Pradesh. Within the state of Andhra Pradesh, it flows through hilly terrain of the Eastern Ghats known as the Papi hills which explains the narrowing of its bed as it flows through a gorge for a few km, only to re-widen at Polavaram. Before crossing the Papi hills, it receives its last major tributary Sabari River on its left bank. The river upon reaching the plains begins to widen out until it reaches Rajamundry. Arma Konda (1,680 m (5,510 ft)) is the highest peak in the Godavari river basin as well as in Eastern Ghats. After crossing Rajahmundry, the Godavari splits into two branches which are called Vriddha Gautami (Gautami Godavari) and Vasishta Godavari. Again the Gautami branch splits into two branches namely Gautami and Nilarevu. Similarly, the Vasishta splits into two branches named Vasishta and Vainateya. These four branches which join the Bay of Bengal at different places, are forming a delta of length 170 km (110 mi) along the coast of the Bay of Bengal and is called the Konaseema region. This delta along with the delta of the Krishna River is called the Rice Granary of South India. Pranhita is the largest tributary covering about 34% of its drainage basin. Though the river proper flows only for 113 km (70 mi), by virtue of its extensive tributaries Wardha, Wainganga, Penganga, the sub-basin drains all of Vidharba region as well as the southern slopes of the Satpura Ranges. Indravati is the 2nd largest tributary, known as the "lifeline" of the Kalahandi, Nabarangapur of Odisha & Bastar district of Chhattisgarh. Due to their enormous sub-basins both Indravati and Pranhita are considered rivers in their own right. Manjira is the longest tributary and holds the Nizam Sagar reservoir. Purna is a prime river in the water scarce Marathwada region of Maharashtra. Other than these 7 principal ones, it has many smaller but significant ones draining into it. Indravati river flood waters overflows in to the Jouranala which is part of Sabari basin. A barrage at 19°7′19″N 82°14′9″E﻿ / ﻿19.12194°N 82.23583°E﻿ / 19.12194; 82.23583﻿ (Jouranala barrage) is constructed across the Indravati river to divert Indravati water in to Sabari river for enhanced hydro power generation. The river is sacred to Hindus and has several places on its banks, that have been places of pilgrimage for thousands of years. Amongst the huge numbers of people who have bathed in her waters as a rite of cleansing are said to have been the deity Baladeva 5000 years ago and the saint Chaitanya Mahaprabhu 500 years ago. Every twelve years, Pushkaram fair is held on the banks of the river. A legend has it that the sage Gautama lived in the Brahmagiri Hills at Tryambakeshwar with his wife Ahalya. The couple lived the rest of their lives in the then village called Govuru, known as Kovvur ("cow") since the British rule. Ahalya lived in a nearby place called Thagami (now Thogummi). The sage, as a reason for the practice of annadanam ("giving away food" to the needy), started cultivating rice crops and other crops. Once, the god Ganesha, on the wish of the munis, sent a miraculous cow maaya-dhenu, which resembled a normal cow. It entered the sage's abode and started spoiling the rice while he was meditating. Since cattle is sacred to Hindus and shall always be treated with respect, he put the dharbha grass on the cow. But, to his surprise, it fell dead. Seeing what happened before their eyes, the munis and their wives cried out, "We thought that Gautama-maharishi is a righteous man, but he committed bovicide (killing of a cow or cattle)!". The sage wished to atone for this grievous sin. Therefore, he went to Nashik and observed tapas to Lord Tryambakeshwara (a manifestation of the god Shiva), on the advice of the munis, praying for atonement and asking Him to make the Ganges flow over the cow. Shiva was pleased with the sage and diverted the Ganges which washed away the cow and gave rise to the Godavari river in Nashik. The water stream flowed past Kovvur and ultimately merged with the Bay of Bengal. Puntamba – A place of pilgrimage with a number of ancient temples including the last resting place (Samadhi) of Sant Changdev in Puntamba.This town is located in Rahata Taluka of Ahmednagar district and 18 km from holy place of shree saibaba Shirdi. The only temple attributed to Kartik Swamy ( Elder son of Lord Shiva) is located here on bank of river Godavari). River godavari which had entered in kopargapn taluka of Ahmednagar from Niphad taluka of Nashik is natural frontier between Aurangabad and Ahmednagar districts of Maharashtra onwards until it enters in confluence with river Pravara at Pravarasangam village which comes under Newasa taluka a town where famous Bhakti saint Shree sant Dhnyaneshwar had written critic on Bhagavatgeeta ' Dnyaneshwari'. Basar (originally, Vyasara) – Sri Gyana Saraswati temple is situated on the banks of Godavari in Adilabad district, Telangana. It is about 210 km (130 mi) from state capital Hyderabad and accessible by road and rail (nearest major station: Nizamabad, although Basar station also exists). It is considered that the sage Vyasa wrote the Mahabharata on the banks of Godavari at this location near Harsha house it is the beautiful scenario, and thus the place came to be known as Vyasara. Kandhakurthi - Thriveni sangamam where three rivers join. Godavari, Manjira River and Haridra River. Bhadrachalam – Hindu Temple of Lord Rama. Kaleshwaram – Sri Kaleswara Mukhteswara swamy Temple is situated here on the banks of Triveni sangamam of rivers godavari and pranahita. It is 125 kilometres away from Karimnagar city, 115 km away from Warangal city. Trimbakeshwar – One of the twelve Jyotirlingas and ancient temple of Lord Shiva. Nanded – Takht Sri Hazur Sahib, one of the five most sacred places in Sikhism. Nashik – One of the four Sinhastha Kumbh Mela, Hindu pilgrimage place. Paithan – Saint Eknath's native place, famous Jayakwadi dam, and a beautiful garden named after Sant Dnyneshwar. Konaseema – Delta of Godavari. Pattiseema – A village where a Hindu temple is located on a small hill on an island in the river. Kovvur – A village where cows resided and a place where the maaya-dhenu fell dead. Footprints of the maaya-dhenu were seen even today in the famous place Kovvur called "Goshpadakshetram" also called "Gopadala Revu" where the footprints of the holy cow are seen near the temple of Lord Shiva. Also a village which is the reason for the birth of river Godavari. Famous for a Sanskrit school which has been built 63 years back. Rajahmundry – A town known for its role in Telugu culture and birthplace of writers such as Nannaya, one of the Kavitrayam trinity of poets who translated the Mahabharata into Telugu. The Godavari Pushkaralu is a major local festival that is staged every 12 years. The Coringa mangrove forests in the Godavari delta are the second largest mangrove formation in the country. Part of this has been declared as the Coringa Wildlife Sanctuary, renowned for reptiles. They also provide an important habitat to a wide variety of fish and crustaceans. These forests also act as barriers against cyclones, tropical storms, and storm surges, thus protecting the nearby villages. There are 4 bridges spanning the river between East Godavari and West Godavari districts. Construction of this bridge started in 1970, and was completed in 1974. It serves as both a railway and a roadway between the East Godavari and West Godavari Districts. An upstream view of Jayakwadi Dam. Dowleswaram Dam near Rajahmundry on the river. The Godavari River is one of the rivers whose water energy is least harnessed for generating hydro electricity. The 600 MW capacity Upper Indravati hydro power station is the biggest hydro power station which diverts Godavari River water to the Mahanadi River basin. The following is the list of hydro electric power stations excluding small and medium installations. The primary/initial catchment of the Godavari drainage basin is largely represented by the basalt of the Deccan Volcanic Province (~50% of the total basin area). This is followed by the Precambrian granites and gneisses of the eastern Dharwar Craton, sandstones, shales and limestones of the Gondwana Supergroup, various sedimentary units of Cuddapah and Vindhyan basins, charnockites and khondalites of the Proterozoic Eastern Ghats Mobile Belt and the sandstones of the Rajahmundry Formation. The Godavari River carries the largest sediment load among the peninsular rivers and the majority of the mass transfer in Godavari occurs during the monsoon. Mineral magnetic studies of the Godavari River sediments suggest that the floodplains in the entire stretch of the river are characterized by a Deccan basalt source. The bed loads on the other hand are of sourced from local bedrock. Influx of Deccan source in the Godavari River up to the delta regions and possibly in the Bay of Bengal off the Godavari, therefore, can be related to the intensive chemical weathering in the Deccan basalts. Abrupt increase in δ13C values and decrease in TOC content accompanied with a significant increase in ferrimagnetic mineral concentration in Bay of Bengal sediments from ~3.2 to 3.1 cal. ka BP reflected a shift of organic carbon and sediment source and a severe decline in vegetation coverage. Such phenomena indicate intensified deforestation and soil/rock erosion in the Deccan Plateau producing higher ferrimagnetic mineral inputs, which is in agreement with significant expansion of agricultural activities in the Deccan Chalcolithic cultural period. A study has found that the delta is at a greater risk as the rate of sediment aggradation (raising the level of the delta through sediment deposition) no longer exceeds relative sea-level rise. It further states that the suspended sediment load at the delta has reduced from 150·2 million tons during 1970–1979 to 57·2 million tons by 2000–2006, which translates into a three-fold decline in the past 4 decades. Impacts of this can be seen in destroyed villages like Uppada in Godavari delta, destruction of Mangrove forests and fragmentation of shoreline – possibly a fallout of dam construction. Said to further epitomise the insensitivity towards Godavari, is the Polavaram Project which is touted to be gigantic – both in terms of size and violations. Deemed as being pointless and politically driven, the project raises questions about environmental clearance, displacement of upstream human habitations, loss of forest cover, technicalities in the dam design which are said to play down flood threats and unsafe embankments. One of the ships of the Indian Navy has been named INS Godavari after the river. Godavari is also the codename of some variants of AMD APU chips. ^ "Sage River Database". Archived from the original on June 21, 2010. Retrieved 2011-06-16. ^ "Integrated Hydrological DataBook (Non-Classified River Basins)" (PDF). Central Water Commission. p. 9. Archived from the original (PDF) on 2016-03-04. Retrieved 2015-10-13. ^ "Dakshina Ganga (Ganga of South India) – River Godavari". Important India. 2014-01-20. Retrieved 2015-10-21. ^ South Asia Network on Dams Rivers and People (2014). "Shrinking and Sinking Deltas: Major role of Dams in delta subsidence and effective sea level rise" (PDF). Retrieved 15 January 2016. ^ "India: Andhra Pradesh Flood 2005 situation report, 21Sep 2005". 29 May 2014. Retrieved 15 January 2016. ^ "Godavari basin status report, March 2014" (PDF). Retrieved 15 November 2015. ^ "Rivers of Western Ghats". Archived from the original on 2011-07-19. Retrieved 2006-12-09. ^ "Spatial variation in water supply and demand across river basins of India" (PDF). IWMI Research Report 83. Retrieved 23 June 2015. ^ "When Bhadrachalam was under a sheet of water". The Hindu. 2011-12-12. Retrieved 26 May 2014. ^ "Water flow data at Polavaram". Retrieved 26 May 2014. ^ "Dudhsagar Waterfalls, Nashik". Nashik Directory. Retrieved 2015-10-18. ^ "Beed district". Government of Maharashtra. Retrieved 15 January 2016. ^ Kenneth Pletcher (2010). The Geography of India: Sacred and Historic Places. The Rosen Publishing Group. p. 28. ISBN 978-16-1530-142-3. ^ Central Water Commission (2012). "Integrated Hydrological Data Book (Non-classified river basins)" (PDF). Archived from the original (PDF) on 2016-03-04. Retrieved 15 January 2016. ^ "Hydrology and water resources information for India". www.nih.ernet.in. National Institute of Hydrology, India. Archived from the original on 21 April 2015. Retrieved 19 October 2015. ^ Venkateshwarlu, K. (2012-05-03). "Godavari". The Hindu. Retrieved 2012-05-16. ^ Maharashtra Forest Department. "Aurangabad Circle". Retrieved 15 January 2016. ^ Nashik. "Nandur Madhmeshwar Bird Sanctuary". Retrieved 15 January 2016. ^ "Dams in Godavari basin". Retrieved 2015-10-17. 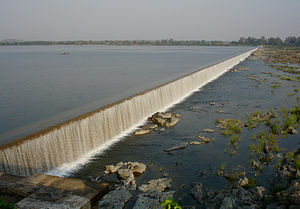 ^ "Dams in Nashik District". National Informatics Centre (NIC), Collectorate, Nashik. Archived from the original on 2013-08-10. Retrieved 2015-10-17. ^ vijdiw. "Jaikwadi Dam and Its Nath Sagar Reservoir". authorstream.com. Retrieved 15 January 2016. ^ "Vishnupuri barrage B00473". Retrieved 30 July 2016. ^ "Power Houses in Godavari Basin". Retrieved 27 March 2015. ^ "Upper Indravati Power_House PH01496". Retrieved 27 March 2015. ^ Kulkarni, Y. R.; Sangode, S. J.; Meshram, D. C.; Patil, S. K.; Dutt, Yatindra (2014-04-01). "Mineral magnetic characterization of the Godavari river sediments: Implications to Deccan basalt weathering". Journal of the Geological Society of India. 83 (4): 376–384. doi:10.1007/s12594-014-0054-x. ISSN 0016-7622. ^ Bikshamaiah, G.; Subramanian, V. (1980-04-01). "Chemical and sediment mass transfer in the Godavari River basin in India". Journal of Hydrology. 46 (3): 331–342. doi:10.1016/0022-1694(80)90085-2. ^ Cui, Meng; Wang, Zhanghua; Nageswara Rao, Kakani; Sangode, S J; Saito, Yoshiki; Chen, Ting; Kulkarni, Y R; Naga Kumar, K Ch V; Demudu, G (2017-06-29). "A mid- to late-Holocene record of vegetation decline and erosion triggered by monsoon weakening and human adaptations in the south-east Indian Peninsula". The Holocene. 27 (12): 1976–1987. doi:10.1177/0959683617715694. ISSN 0959-6836. ^ Pawar, Yogesh (18 March 2013). "Krishna, Godavari basins drying up". Retrieved 15 January 2016. ^ J. Keller, A. Keller and G. Davids. "River basin development phases and implications of closure" (PDF). Retrieved 25 August 2012. ^ R Prasad (2009-09-21). "Sinking Indian deltas put millions at risk". The Hindu. Retrieved 15 January 2016. ^ South Asia Network on Dams, Rivers and People (2014). "Godavari's Story". Retrieved 15 January 2016. ^ B Hema Malini; K Nageswara Raol (10 November 2004). "Coastal erosion and habitat loss along the Godavari delta front – a fallout of dam construction (?)" (PDF). Current Science. 87 (9): 1232. Retrieved 15 January 2016. ^ Mahapatra, Richard (2011). "Polavaram fraud". Retrieved 15 January 2016. ^ Times of India (5 July 2015). "Polavaram dam works to begin on Oct. 22". Retrieved 15 January 2016. ^ Rediff News (29 May 2014). "Telangana bandh over Modi govt's ordinance on Polavaram". Retrieved 15 January 2016. ^ "Alkalinity and salinity bane of soil in T state". Retrieved 23 October 2015. "Godavari" . Encyclopædia Britannica. 12 (11th ed.). 1911. p. 170.